(ii) electronic bill post 5 April. However you can elect to have one electronic bill for both or seek the consent of the court and other party to dispense with the paper-less bill. The electronic bill is also not required if costs are fixed or one party is a litigant in person or a challenge on client own solicitors costs. The detailed spreadsheet should make it easier for paying parties to challenge the amount their opponents spent on particular aspects of the case. At the same time, it should make it harder for receiving parties to fudge the figures and get away with padding bills. From the judges’ perspective, the electronic bill is intended to give a clearer overview, with the ability to zoom in easily and explore in greater detail any areas that cause a judicial eyebrow to be raised. The 92nd Practice Direction provides the update and introduction of Precedent S.
What about every day time recording? Many solicitors will leave the complete process of recording their time in their Case Management System. If they have integrated the CMS with the Excel Precedent S spreadsheet (or own bespoke version) to provide immediate reports then that is a plus. If, like many, the costs of integrated bespoke software are prohibitive and you would want to get to grips with how to complete the Precedent S then this blog will provide you with some guidance tips. I can also offer practical training on how to complete Precedent S Electronic Billing, please contact me on the link. The first thing is to download the free version of Precedent S electronic bill of costs. For those of you that have some background knowledge of excel spreadsheets you will note that it is built around the excel Pivot Table and uses the LOOKUP function on many aspects of the calculations that permeate throughout the multiple tabs that can make valuable assessment of cost by by task, activity, phase, communication etc. It is a very valuable tool to help solicitors monitor the costs and find out exactly how time has been spent. The spreadsheet at first workings are commendable. But the spreadsheet is vast. It has 17 TABS and on one TAB, 55 Columns. Yes to repeat 55 Columns!! But if you have no or little knowledge about formulas in excel, the use of Pivot Tables and LOOKUP functions then don’t despair. Whist it is not easy to get to grips with initially but after spending some time it becomes much easier to complete and less stressful. This article is designed to help solicitors, para-legals and support staff to find their way round the bill of legal costs and understand how to complete it. Within my firm, we use the excel electronic billing along side our stand alone Case Management System. We do not have an integrated system as the costs are prohibitive. So we now post directly to the spreadsheet. In the long term, whilst it is quite labour intensive at first and it takes time to get use to it, the system becomes very easy to use, second nature and will save a considerable amount of time as there will be no bill to complete at the end as you have already done it. Further I am developing and streamlining inputting of time to speed up the process making the administration task less burdensome so as to increase the profitability of your legal staff and solicitors. TAB 2 – Certificate – The usual certification of the bill as used in the paper bill. TAB 3 – Synopsis – The usual background of the case as used in a paper bill. 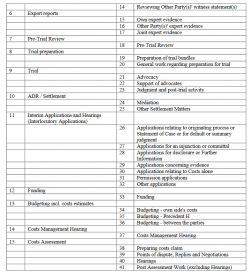 TAB 4 – Chronology – Usual chronological events of the case, (but do not enter any costs/disbursements). TAB 5 – Legal Team – Rates – Identify fee earners, Grades and Hourly Rates. TAB 6 – Funding Parts – If the bill has more than one funding type i.e. pre and post CFA work – 2 Party Bill. TAB 7 – Summarily Assessed Costs – Costs that have been summarily assessed entered here. TAB 8 – Main Summary by Phase – Provides instant assessment of costs by phase. TAB 9 – Summary – Task, Activity, Expenses – Provides a neat summary of the events & costings. TAB 10 – Summary Budget v Bill – Provides a view of budgeted figures compared to the bill. TAB 11 – Summary by Part – Provides split between any different parts of the bill. TAB 12 – Summary of Communications – Great view of just communications charged to the bill. TAB 13 – Bill (Print Version) – A printable version of the bill. TAB 14 – Bill Detail – A detailed analysis of the bill. TAB 15 – Reference Table – A handy reference to Phases and Tasks. TAB 16 – Reference Table Activities – Handy reference to activities and codes used. TAB 17 – Reference Table Expenses – Handy reference to expenses and codes used. The first 6 tabs are self-explanatory and form part of the title of the case, the parties involved in the litigation and the fee earners/solicitors involved together with their charge out rates. Tabs 7 to 14 provide an excellent breakdown of how costs are incurred and budgeted. For each entry into the electronic bill there are three main new considerations you have to post when making a time entry. They are Phase, Task and Activity. When you are familiar with the terminology and its relevance within the spreadsheet, it becomes easier to navigate and post your time quickly and accurately. The phase codes are below from the 92nd CPR update. There are 15 in total and mostly mirror the Phases set out in Precedent H which most will be familiar with. 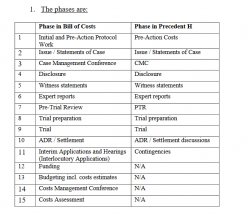 However, as you can see, there are additional Phases in the Electronic Bill of Costs (11 – 15 inclusive), which takes into account interim applications, funding and the last three dealing with costs aspects of the case. Once you select a Phase Code, you then select a Task Code. Below is a breakdown of the Task used that is linked to the Phase Code. As can be seen, there are 41 Tasks, but for a lot of day-to-pay posting of time, many will not be used or not used often. You then have to choose an activity, the Activity Codes mainly relate to the medium of ‘communication’ which lawyers engaged in on a file. Appear for/Attend – (eg attending upon Client in person, meetings with third parties and attend court). Plan, prepare, Draft, Review – (the document/drafting time). Note there is no entry for Text Messages or Social Media communications. Query can it be billed? Looking at the spreadsheet at first glance it can be quite daunting for those not familiar to excel as there are 17 TABS. When I downloaded Precedent S it did not come with any instructions on how to enter data to get started! There is sample data that you can download which helps however. After some experimental trials, I quickly realised the spreadsheet is based on a Pivot Table and that the data the entire spreadsheet relies on is the information that you input into one TAB. However there are prerequisites you must undertake before you begin posting into the paper-less bill which include the completion of the legal team (TAB 5), Funding & Parts (TAB 6) in particular. So TAB 14 is the starting point once you have done the prerequisites. The next thing now is to go ahead and post a Phase, Task and Activity. The following is an explanation of how to post the following time recording for the most common work a solicitor will undertake in a multi-track personal injury in England and Wales. Below is a screen shot of Precedent S, some sample data for the first 21 Columns in a 55 Column spreadsheet at TAB 14. 2. Complete the basic information such as item number (not sure at the time of writing the significance between Item No and Entry No), Part of the bill (ie pre CFA work (Part 1) and Post CFA work (Part 2)); and Date all found between column A to D.
3. Complete ‘Description of Work’; eg. ‘Email Out – Client‘ (Column E). This is free text. 4. 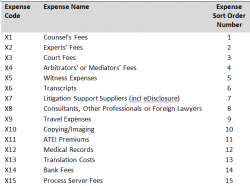 At (Column F (LTM)) input the fee earner’s initials. 5. Under Time (Column G), input charging time, here one long email to client, thus charged 0.5 hrs. 6. Ignore (Columns H – L inclusive). Column N – Phase Code – Choose Code P1 – Initial Pre-Action Work, Pre-Action Costs. 9. (Column Q) This is the expense code, do not complete, see later when paying for a disbursement. The rest of the spreadsheet will pre-populate with the posted time and a full narrative of the Phase, Task Name and Activity Name, see screen shot below. Please be aware that in the Screen Shots above, it does not provide the actual alphabetical codes, but they can be found in the Precedent S sample data spreadsheet. I can send you a list of the Codes if you wish, please contact me via my website. Here we are posting a telephone call into Precedent S, in the new electronic bill of costs because we are chasing a GP for the medical records, at the Pre-Budget Phase. 1. Follow the initial input guidance above to stage 7. PHASE CODE P4 – Disclosure (Column N). 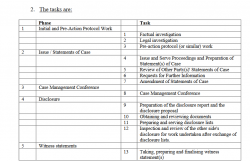 TASK CODE T10 – Obtaining and reviewing documents (Column O). ACTIVITY CODE A10 – Communicate (other external) (Column P). At the time of writing, it appears from the Sample Data supplied with the new Precedent S, is that when a disbursement is entered it should be for that item only without also charging anything else; for instance the letter (unless paid electronically by BACS/Online etc) that accompanies the cheque or charging for any preparation to deal with the request for the cheque for payment, which I usually with charge one unit. 2. (Column J) Enter the amount of the disbursement, in this example £50 GP fee. EXPENSE CODE X12 – See list of Expense Codes below in the screen shot (Column Q). Columns AS, AT, AU, AW, AY – with the amount which is used in the Excel Pivot Table for various reporting. 4. How to record Preparation/Draft Document Time. 1. Follow the initial input guidance above to stage 7 (The narrative for ;Description of Work’, will be e.g. ‘Consider GP Case Notes.’). ACTIVITY CODE A10 – Plan, Prepare, Draft, Review. Don’t Panic about completing Precedent S – Electronic Bill of Costs. Writing everything out tends to make it look a lot more complex that it really is. The spreadsheets are really a powerful tool once you know how to use it. It is the best thing that has ever happened to the billing of solicitors costs. If you look at the far right column, it compares and contrasts the agreed budget with the bill to see if here is a departure of the last approved budget. Very useful indeed. Law Costs Draftsman v Do It Yourself? Your fee earners with a bit of training can complete the spreadsheet as they go along like in any normal CMS. If done in this way, you can obtain an entire bill of costs as soon as the work is complete, no waiting for weeks or months to get your bill back. The process will save you £THOUSANDS. If you need any training on completing Precedent S and the new electronic bill of costs for solicitors please contact me if you do require help and assistance. DISCLAIMER – I am a solicitor with considerable personal injury experience (30 years) but I also possess some basic knowledge of creating and using Excel spreadsheets. I say basic, but that is all you need to complete and understand the working of Precedent S for electronic billing. As it is early days, naturally there are no guarantees or assurances and therefore no liability for any loss or damage arising out of this blog or subsequent advice on any training seminar offered by me or my firm at a later stage.